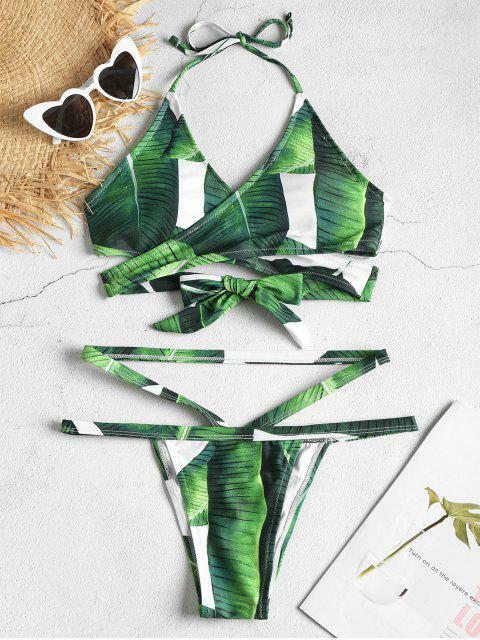 [25% OFF] 2019 Leaf Print Wrap Bikini Set In DEEP GREEN | ZAFUL .. This bikini is great. It took me a while to figure out how to put it on at first, but I'm sure other folks would be more competent than I am in that regard lol! It has a beautiful deep colour, true to the photos and I can't wait to wear it! Constructed in the tropical leaf pattern with a wrap-effect waist, the halter top features removable pads and ties it up at the back and adjust it how you want, while the pairing bottoms are detailed with the narrow waistband and fixed strappy around the waist for a cutout effect.